University of Burgos. May 2001. “Irlanda ante un nuevo milenio”. University of Barcelona. May 2002. “The Representation of Ireland/s. Images from Outside and from Within”. University of Almería. May 2003. “Irish Landscapes”. University of Málaga. May 2004. “Humour and Tragedy in Ireland”. University Rovira i Virgili, Tarragona. May 2005. “Re-writing Boundaries”. University of Valladolid. May 2006. “Imaginary/Real Ireland”. University of A Coruña. May 2008. “The Rocky Road to Ireland: Irish Studies in the Wake of the Tiger”. University of Alcalá de Henares. May 2009. “From Local Ireland to Global Ireland: The Reality Beyond”. University of La Laguna, Tenerife. April-May 2010. “Brandan Rising! Irish Identities Inside and Outside the Island”. University of Oviedo. May 2011. “(Un) Becoming Irishness: Imperfections and National Identities”. University of Huelva. May-June 2012. “Words of Crisis, Crisis of Words. Ireland and the Representation of Critical Times”. University of Extremadura. May – June 2013. “Voice and Discourse in the Irish Context”. University of Deusto. May 2014. “Éire/Ireland and Dysfunction”. University of Granada. May 2015. 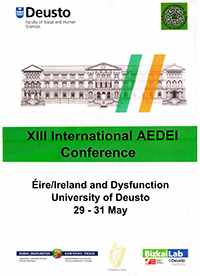 “Discourses of Inclusion and Marginalisation: Minority, Dissident and Mainstream Irish Identities”. University of Zaragoza. May 2016. 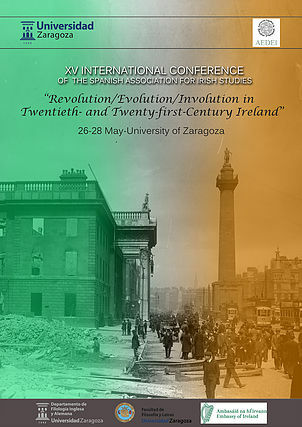 "Revolution/Evolution/Involution in Twentieth- and Twenty-first-Century Ireland".